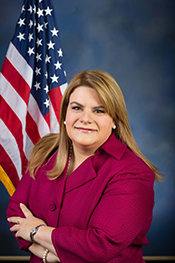 GONZÁLEZ-CÓLON, Jenniffer, a Resident Commissioner from Puerto Rico; born in San Juan, P.R., August 5, 1976; B.A., University of Puerto Rico, Rio Piedras, P.R. ; J.D., Inter American University of Puerto Rico, San Juan, P.R. ; L.L.M., Inter American University of Puerto Rico, San Juan, P.R. ; chair, Puerto Rico Republican Party, 2015-present; co-chair, Puerto Rico Republican Party, 2004-2015; vice-president, New Progressive Party, 2008-present; member of the Puerto Rico house of representatives, 2002-2016; speaker, 2009-2012; minority leader, 2013-2016; elected as a New Progressive to the One Hundred Fifteenth Congress to a four-year term in 2017 (January 3, 2017-present).